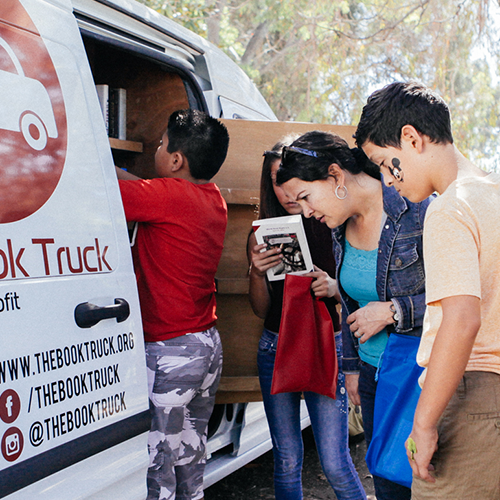 The Book Truck is a great addition to your school or organization’s event! We visit and distribute books to teens at large events in partnership with Los Angeles area Title 1 high schools and other organizations for underserved teens, especially foster youth. Events should be for 100 – 500 teens (grades 7-12). Please keep in mind that we plan our schedule a semester in advance. Thus, if you would like us to participate in an event for the spring, you would need to apply in during the fall semester. Past events have included parties, orientations, and commencements with these partners. We will bring carts and tables to arrange our books on. If your event is outdoors, we can bring the truck too. We’ll arrive ~1/2 hour before your event to set up. 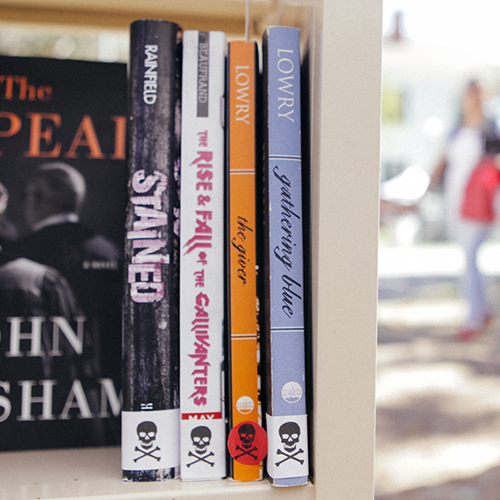 At the event, teen volunteers will help individually recommend books to your teens, who will walk away with 2 exciting books! Fill out an event application today to learn more. Please keep in mind that we plan our schedule a semester in advance. What books/content is in The Book Truck’s collection? We carry Young Adult titles in our collection, some of which may contain controversial themes, mature content, and/or profanity. If you have concerns about this, please let us know and we can speak with you about these titles in more detail. Learn more about the books we choose to carry. Do you have teens we can train to have recommended the books at your visit? For the optimal experience, a group of 4-20 teens from your organization will be trained in advance to give away books to their peers at the visit. Groups like book clubs, honor societies, and service-learning groups are ideal groups to invite to volunteer. Volunteers from your organization are required for weekday events; for weekend events, we can bring external teen volunteers if necessary. During the one hour training, participating teens will be introduced to The Book Truck’s unique teen-friendly sorting system, which will familiarize them with the books and the way we categorize them. Then teens will learn how to support and empower their peers in the book giveaway. If the volunteering teens are available for a longer training (~3 hours), they will sort the actual books to be used for the giveaway into our sorting system, which provides an even richer experience for the volunteers. If your organization does not have a group of teens to train, we may partner with an alternate group of teens to support the peer-to-peer book recommendation model that we have found works best with teens.